This year has started with a bang! After the release of SMAUG I'm helping a couple of users with getting started. We have a lot of work to undertake including documentation and improving usability. We continue to test the code and we are currently preparing a model which will run across multiple GPUs. The problem we will consider in this validation exercise is that of modelling the solar atmosphere with the chromosphere acting as a resonant cavity. The solar atmosphere model based on modelling and measurements of VALIIIc and McWhirter, with this representation of the quiet sun our initial tests consider a magnetic field free region so we are using a hydrodynamics model, this is ideal for code testing but the physics is interesting. With a periodic point drivers of periodicity 30 and 300 seconds we can see surface waves propagating along the transition zone. It's very encouraging. The next step will be to extend the height of our model atmosphere and understand how the modes propagate through higher levels in the corona. 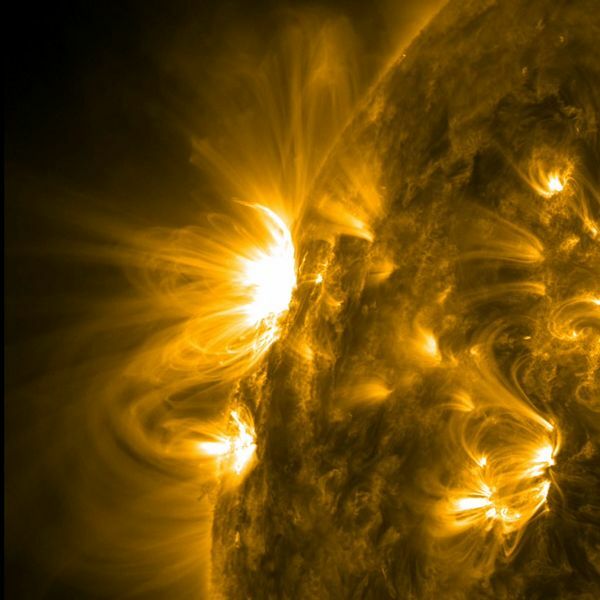 Reports from SDO say that this week an interesting active region has come into view, there is a suggestion that flaring activity may result. 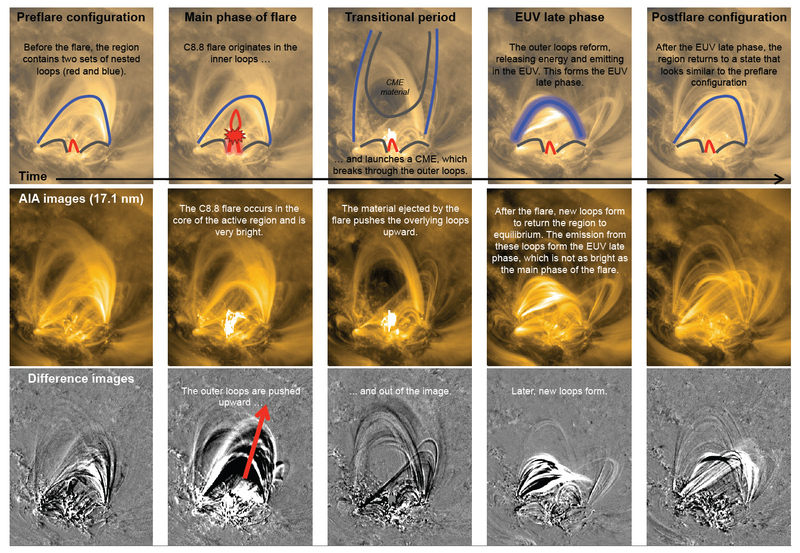 The movies from SDO show how the loops evolve and one of the phenomena which is observed is the reconfiguration of field loops. 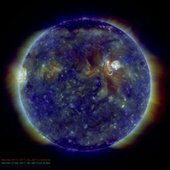 Over the last few weeks I've been attending the regular Solar Physics seminars. This week ended with a seminar about failed filament eruptions, these are events which don't result in a full coronal mass ejection. 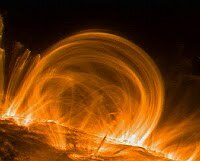 During the seminar on failed filament eruptions we were presented with evidence from SDO for twisted flux tubes. Also the characteristic sigmoid pattern after a reconnection event was observed. For the scenario presented in the seminar the enclosing loop had effectively contained the filament eruption. Reconnection is a phenomena responsible for a significant quantity of energy release. As suggested by its name it is that process by which magnetic field lines undergo topological reconfiguration. A simple examples is illustrated by the analogue diagram shown above. The cartoon below illustrates a sequence of coronal loops with potential to reconfigure the carpet of magnetic field lines. The image below identifies the reconnection events which take place through the life of a coronal loop. Often, during periods of activity these phenomena may be observed in SDO imagery and particularly the AIA171 instrument.